As former Double Clickers and career-long Google fans, we’re partial to the Google Marketing Platform. It offers tools that span the entire digital marketing landscape and allows you to strategize, execute, manage, analyze and optimize your campaigns all in one comprehensive solution. The Google Marketing Platform allows you to gain a more thorough understanding of your audiences, make informed decisions, unlock insights and easily share them across teams, and help you achieve your goals faster. It all starts here. We can help you gain a deeper understanding of your customers and unlock insights to help you succeed. Get a complete view of your display campaigns and target – and reach – the right customers. We help you make smarter decisions and achieve more with your search campaigns. Simplify your media planning, trafficking and reporting workflows in one integrated interface. Not a developer? No problem. We can help you manage tags without editing code. Test and customize your website experience to drive better results. Get to know your audience better and make more informed business decisions – without time-intensive market research. Let us help you look at the big picture—literally. Dive deep into your one-stop data dashboard and tell your story. Get help implementing apps like Gmail, Docs and Drive, all powered by Google AI. 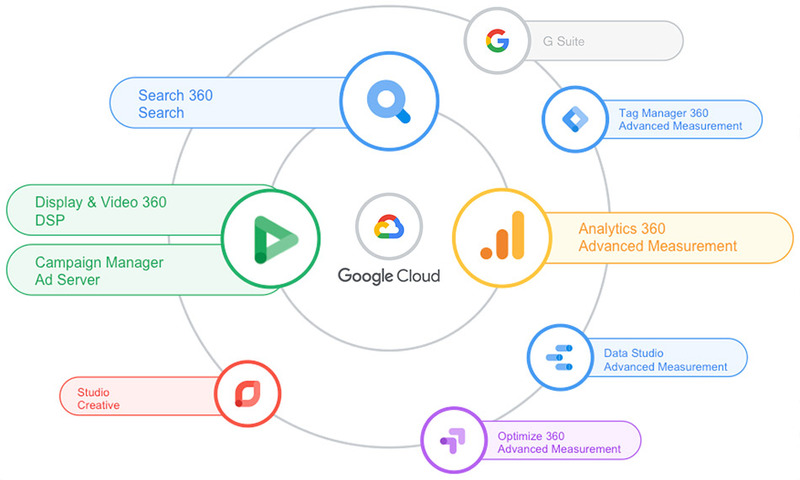 Let us help you implement tools like BigQuery, Cloud for Marketing and machine learning to create predictable customer growth and identify valuable audience segments. Learn how to get started with the Google Marketing Platform.